We've been hearing a lot about Netflix's new comedy Wine Country, which serves as a big Saturday Night Live reunion for some classic Not Ready for Prime Time Players. Tina Fey recently teased the epic bash on Jimmy Fallon, but fans didn't actually get to see any footage. Now, we have our first trailer, and this one looks like a keeper. The Netflix comedy is a virtual who's who of SNL icons from a bygone era. Rachel Dratch gets to finally headline her first movie after years of playing the goofy sidekick. And audiences are definitely ready for her triumphant return to the forefront, after she recently received gasps and applause for her surprise appearance in this weekend's switcheroo hit Little. Amy Poehler, who went onto star in Parks and Recreation after leaving Saturday Night Live, makes her directorial debut with Wine Country. And of course she's brought her old pal Tina Fey along for the ride. Though Fey only has what will result in a glorified cameo. 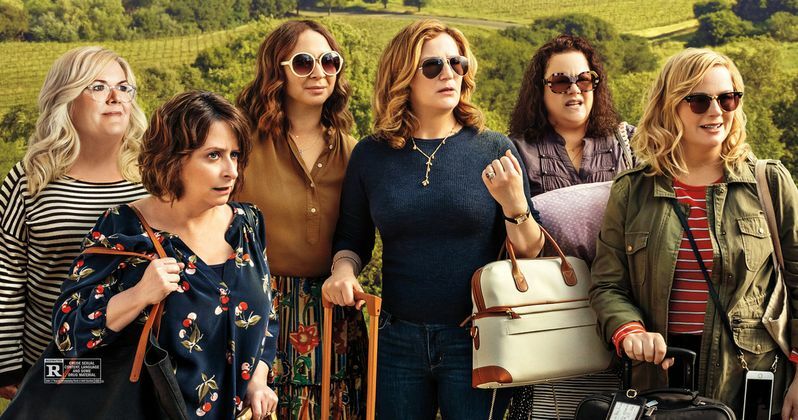 In honor of Rebecca (Rachel Dratch)'s 50th birthday, Abby (Amy Poehler) plans a scenic Napa getaway with their best, longtime friends. Workaholic Catherine (Ana Gasteyer), post-op Val (Paula Pell), homebody Jenny (Emily Spivey), and weary mom Naomi (Maya Rudolph) are equally sold on the chance to relax and reconnect. Yet as the alcohol flows, real world uncertainties intrude on the punchlines and gossip, and the women begin questioning their friendships and futures. A hilarious and heartfelt comedy directed by Poehler, Wine Country co-stars Tina Fey, Jason Schwartzman and Cherry Jones. Amy Poehler is directing the movie from a script she collaborated on alongside writers Emily Spivey and Liz Cackowski. Poehler is also the main producer on the movie working with Morgan Sackett. The official trailer comes direct from the Netflix streaming Youtube channel. They have also dropped the poster, which shows us what this reunion looks like. And it's pretty tasty.